My fears are confirmed. Other species of insect have been enhanced with clockwork innards. I discovered this lady bug showing its modifications in a patch of flowers in one of the more civilized pockets of the Park. Its clockwork pieces have transformed it into a faery-devouring apparatus. I observed it chew up grazing aphid-analogues at three times the speed the moth pixies can. A dozen of them could cause a complete ecosystem collapse in favor of the clockwork bugs over the moth pixies. Not that I am fond of the biting, foul little things, which spread the aphid-analogues, farming them into gardens on the edges of the Park. Perhaps the tinkerer responsible for these transformations is a disgruntled gardener whose protections have gone wild? I will publish my findings and captures in the next issue of the Neo-Urbana Natura and hope that someone can provide more clues to this mystery. I read with great interest your latest paper in Natura. I cannot express how delighted I am that someone as talented in the natural sciences as yourself has discovered my creations in the wild, serving their purposes without failure. I have heard of your reputation as a scientist, and I will admit to have taken strides to ensure that you would encounter my creations. I’ve had my agents seed them among your mail, for instance. For whatever reason, you never discovered them, I take it? Alas! But no matter. You found them in the wild, which is far more interesting a setting. I wish to correct you on one issue; you have ascribed to me motives greater than the reality, I am afraid. I build my creations not out of favoritism or hatred for your warring factions. I simply create to add to the mix, and you might discover that my creations have no more love for insects than faeries. They are something entirely new, and I am inordinately proud of them. Good luck in your future research. I hope you can appreciate my creations for the miracles that they are. 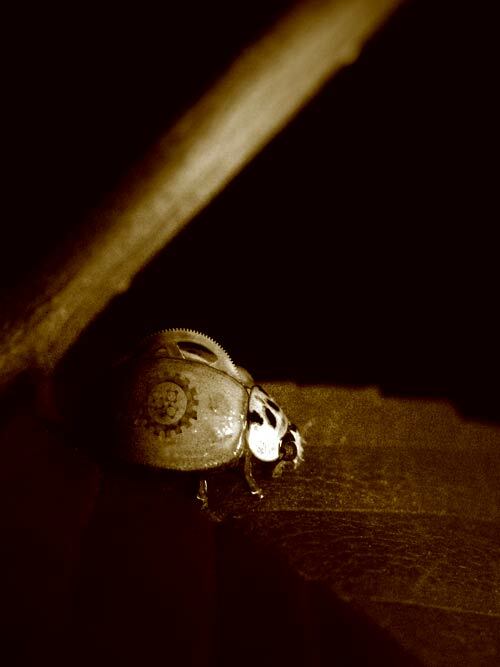 I have tested the Tinkerer’s suggestion that the clockwork insects will prey equally upon real insects as they do the native faeries with an experiment involving test tubes and the clockwork lady bug that I captured previously. His claim holds true. Each time I begin to understand the greater picture of the workings of nature here, I discover some new complication. I hadn’t expected the complications to come so directly from other scientists. It’s a very troubling idea, and one that will haunt my thoughts frequently in the coming months. For now, I will commit myself, for now to cataloging the creations of this “Tiny Tinkerer.” And I will collect specimens, and I will examine them for weaknesses. I do not trust the claims of this letter. Something far more sinister may be afoot. I will write a letter to the editor of Natura posthaste encouraging my colleagues to do the same. Regarding the stowaway in my shipping container from some weeks ago—I believe it now to have been planted among my things, a clockwork creation of the Tinkerer. At least that is one—albeit tiny—mystery solved. Not that it provides me much comfort.